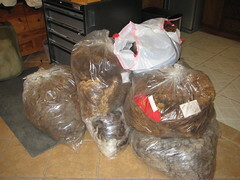 I've been focusing on hand-combing a fleece to get it ready for the drumcarder. hmmm. This is one of Robin Snyder's fleece, and it has a blue ribbon, but no name. Oh wait, let me go look at the receipt... it's Stardust! I'm going to make another gansey out of this one. (what's Norse for grand-dottir?) Stardust is a gorgeous silver-brown finewool. My working hypothesis is that since this is a finewool, there tend to be itty bitty second cuts because the staple is so crimpy. And those will make pills. So, I'm combing staples with a dog comb. Then they'll go into the drum carder before being spun. A lot of work? Yes, but oh, so worth it. So far, I've got 10 ounces combed, and I'm aiming for 32. When my hands get tired, I run some of the white romney through the carder and spin it for the tapestry. 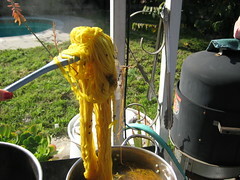 The plan for the tapestry is to spin and then dye with either dodder or oxalis, then overdye with indigo. These greens will go into a Navajo-type tapestry... see A Guide to Navajo Rug Weaving Styles for an illustration. I'm babbling, and I realize it. I'll come back and edit this tomorrow, and make it coherent if necessary. And PICTURES! I will post pictures! This is dodder, a parasite that grows in the rainy seasons. 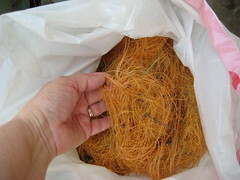 It's also called angel's hair, or witch's hair. The Latin name is either Cuscuta subinclusa or Cuscuta californica... I'm not an expert botanist, that's a Google guess. And it gives a gorgeous and intense color! It was a wonderful Dye Day.